On July 18, the day of the world premiere of Repo! The Genetic Opera, I was fortunate enough to be able to interview the film’s director, Darren Lynn Bousman, best known for his Saw films, and star, Alexa Vega, of Spy Kids fame, at the Fantasia Film Festival in Montreal. They had been doing interviews all morning and I was around for some of that time watching them be passed around from media to media, each time giving the most excited and passionate responses. Even though they had been probably answering the same questions hundreds of times, they never lacked enthusiasm or gave a hint of boredom. Whereas most media present interviewed the director and star together, I got to talk to each of them individually for several minutes. Both Bousman and Vega are dedicated to their fans, each with their own myspace accounts, blogs, websites, and videos for fans to get better acquainted with the Repo! world of organ transplants, implants, and repossessions. It is important for them to be connected, as the film’s success is currently dependent on word of mouth and Internet buzz. 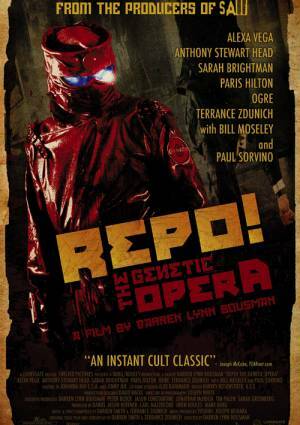 Repo!, I must add, should be an instant success as it is one of the most original features I’ve seen in a long time. The music and choreography, and the story and talent involved are just as impressive as the backdrop enveloping the film. There is no question as to why Bousman and Vega — who plays Shilo, a 17-year-old girl suffering from a rare blood disease — were so excited to share their stories and insights of the Repo! world. Repo! The Genetic Opera is set to open in select markets on November 7.